Some events just make you go 'hmmm', and last week's Amplified08 was one of them. A critical mass of UK social media types assembled themselves at NESTA for an evening's unconference, and real cred goes to the volunteer organizers for pulling it together. The declared mission of this Network of Networks is to boost interconnectedness - but that strength also seemed to me to be it's weakness. Amongst the Twittering throng my head throbbed with the question 'Amplify what?'. Amplify creativity? Amplify business? Amplify racism? 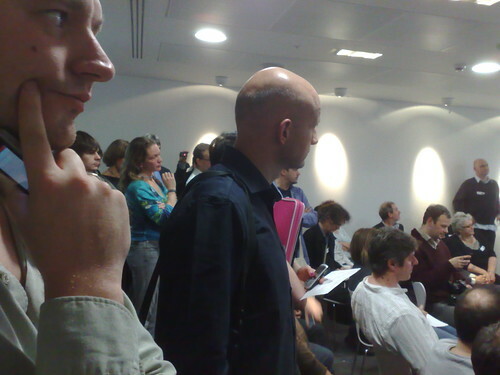 Perhaps most of the crowd at #amp08 felt that more connectedness is enough of a purpose, and fair play to that. Robert Putnam's take on Social Capital highlights the collective value of all social networks and the inclinations that arise from these networks as a broad societal measure of communal health. But let's not forget that Bourdieu, another pioneer theorist of social capital, emphasises it's role in forming and maintaining elites. Part of my 'hmmm' is to wonder which way is the Amplified 08 - 09 - 10 train is heading. The other 'hmmm' I have is a frustration that there could be something really powerful in Amplified 09, but only if it's mixed with other ingredients. The voices that really need amplifying are "the Other"; the excluded and the marginalised. I'd be switched on by a social media geek gathering that nailed that mission to it's mast, in the same way that 4IP is digitalising Channel 4's public mission to "champion alternative voices and fresh perspective and to challenge people to see the world differently". So we've had Amplified 08 and we know who 'we' are; let's get out there and mash it up with the outsiders. As it says in NESTA Connect's core beliefs "extreme collaboration can lead to bigger leaps forward".